One way I try to keep God first in my life is by disciplining myself to engage with God in prayer and Bible reading before I engage in the world around me through my work. But when part of my work includes thinking and writing about the things of God, the imaginary lines I’ve drawn between “God” and “work” get blurry. I’m a night owl, not a morning person, but I get up before my family so I can fill my tank with thoughts of God before before it gets filled with the cares of my busy day. With 10 people in our family, the wee hours of the morning are the only time that my world is quiet enough for me to have a complete thought without interruption. Often I will be praying or studying the Bible and I will be intrigued by a particular idea. I know I must write my thoughts down immediately or else they evaporate into the Great Unknown, so I pause my study to jot down my idea. Once I open that door with my pen, more thoughts I didn’t know I had rush in and beg to be given words. The better the idea, the messier my handwriting becomes. Before I know it, my Quiet Time gets hijacked by thoughts that pester me until they are released onto paper. But then, thankfully, Reason and Grace team up and shove Guilt aside and I realize that meditating on who God is and how He impacts my life and preparing to share that message with others IS spending time with God. Then it occurs to me that perhaps this is how it is meant to be. God and I working together side by side so completely that my communion with Him and my efforts to fulfill the purpose He has for me are indistinguishable from one another. I usually don’t have a complete idea when I begin to write. It starts as one small thought and the idea only comes to fruition ofter I start to write it down. Writing is the clearest way I sense God speaking to me. He leds me to write what He wants me to learn. He reveals His heart to me thorgh the words that flow from my pen. What if all my efforts looked like that? What if I stayed tighter with God in my mothering? In my marriage? In my hobbies? In my job? What would it be like to sense God so near and present while I nurture and raise my children? While I manage our household and keep things running on a daily basis? While I’m at the grocery store, folding the laundry, teaching school, or serving at church? The very One who created my children longs to be my Constant Companion in growing them. How often do I neglect His presence because my focus is on the enormity and complexity of the tasks that lie before me, and my own failures and inadequacy? What grace, power, and wisdom have I missed because I used my busyness as an excuse to ignore the Only One who can fill me with what I really need to give others? I think life is not so much about keeping God first in the order of events in my schedule as it is keeping Him first all the time in every activity of my day. I need to ask God and myself, “How can I do this for the glory of God?” And if I can’t, then it shouldn’t be done at all. I want to live my life in such a way that my “quiet time” with God is not just another activity on my to-do list. And I don’t want to ever think I’ve “finished” my quiet time and I’m ready to move on to the next thing. I want to find a way to live in perpetual quiet fellowship with God within myself even when the chaos rages around me. I’d love to hear your ideas on this topic. How can we keep God first in everything all the time? What does that look like practically in the midst of our busy days? Please post your thoughts in the comments below or message me through the Contact Me page. Thanks for visiting here today. I’m glad you came. I hope you become increasingly aware of God’s presence in the midst of your day, even if it’s a messy one. Let this beautiful song inspire you. 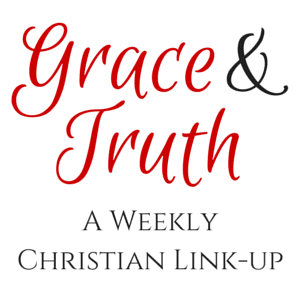 I have linked up today with other bloggers at the Grace & Truth Link-Up. I love this and needed to read such a post. I have no children so I am on the other end of life from you, yet I still need that beautiful quiet time with God. I still need to deal with guilt and those things that get in the way of what I think I am supposed to be doing. BUT…more often than not, God meets me right where I am when the eyes of my heart and spirit are open and waiting for Him. I have been blessed, Elizabeth. Visiting from Grace & Truth. Linda, it’s so nice to meet you. I’m really glad you stopped by. Teaching is such a wonderful and vital role. The children you teach are blessed to have someone who cares about them and loves teaching. I hope you have a blessed week.